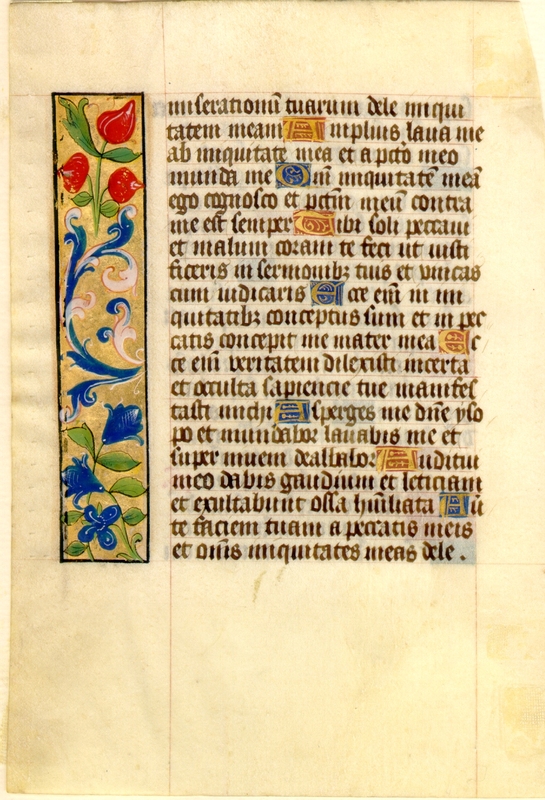 Text: This leaf contains text from the Seven Penitential Psalms, numbers 37 and 50.
supergaudeant mihi inimici mei: et dum commoventur pedes mei, super me magna locuti sunt. Quoniam ego in flagella paratus sum: et dolor meus in conspectu meo semper. 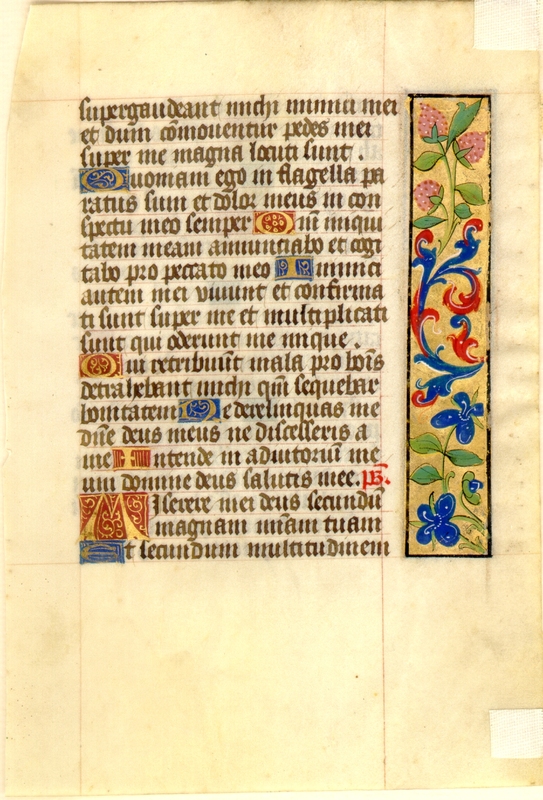 Intende in adiutorium meum: Domine Deus salutis meae. Psalmus. [from Psalms 37] ...lest sometimes my enemies rejoice over me: and whilst my feet are moved, they spake great things upon me. Because I am ready for scourges: and my sorrow is in my sight always. Because I will declare my iniquity: and I will think for my sin. But mine enemies live, and are confirmed over me: and they are multiplied that hate me unjustly. They that repay evil things for good, did backbite me: because I followed goodness. Forsake me not O Lord my God: depart not from me. Incline unto my help: O Lord God of my salvation. Psalm. miserationum tuarum: dele iniquitatem meam. Asperges me hyssopo, et mundabor: lavabis me, et super nivem dealbabor. Auditui meo dabis gaudium, et laetitiam: et exultabunt ossa humiliata. [continuing Psalms 50] ...of thy tender mercies: blot out my iniquity. Wash me more from my iniquity: and cleanse me from my sin. Because I do know my iniquity: and my sin is always against me. To thee only have I sinned, and have done evil before thee: that thou mayest be justified in thy words, and mayest overcome when thou art judged. For behold I was conceived in iniquities: and my mother conceived me in sins. For behold thou hast loved truth: the uncertain and hidden things of thy wisdom thou hast made manifest to me. Thou shalt sprinkle me with hyssop, and I shall be cleansed: thou shalt wash me, and I shall be made whiter than snow. To my hearing thou shalt give joy, and gladness: and humbled bones shall rejoice. Turn away thy face from my sins: and blot out all my iniquities.